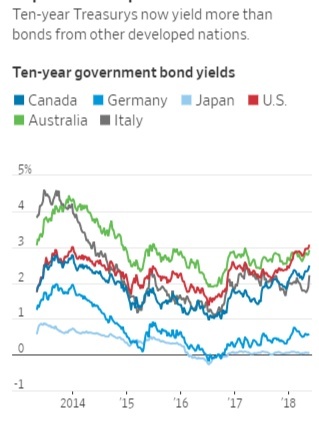 The Wall Street Journal notes that interest rates on United States government debt are now higher than rates for debt from all other developed countries for the first time in almost two decades. The yield on the benchmark 10-year Treasury note, a key barometer for borrowing costs for consumers and companies, last week topped 3.1%, its highest close in almost seven years. And it is only the beginning folks. In the EPJ Daily Alert, I am warning that we are at the start of a multi-year advance in U.S. interest rates, if not a multi-decade advance. And this would be “responsible “ interest rate policy all things considered, right?